6/28 Cup of Coffee: Allen Webster was dominant for the PawSox, Keury De La Cruz (pictured) smacked five hits for Portland, and Sam Travis hit his first professional home run for Lowell. Brian Johnson had a solid, but wild, start, and Carlos Asuaje continued to terrorize South Atlantic League pitching. Allen Webster had one of his best starts of the season, leading the PawSox past the Norfolk Tides, 4-2. Webster went the first 7 2/3 innings, allowing two runs while striking out nine without issuing a walk. He retired the final 13 men he faced, and looked dominant while doing it. Tommy Layne picked up his sixth save with a scoreless ninth. Mike Carp appeared in his first game of his rehab assignment, going 0 for 2 in four innings. The PawSox took advantage of some miscues by Norfolk, scoring on a throwing error and a wild pitch, in addition to a single from Justin Henry and a sacrifice fly from Travis Shaw. Portland pummeled the Reading Fightin Phils (PHI), scoring a dozen runs en route to a 12-2 victory. Brian Johnson allowed only one run on five hits, but also walked four while striking out seven. The walks could have been a result of a small strike zone, as the teams combined to walk 18 batters on the night. Keury De La Cruz was the offensive star of the game, going 5 for 6 with a double and three RBI. Peter Hissey added three hits and a double, and Blake Swihart went 1 for 2 with four walks. Cody Kukuk continues to struggle, as Salem fell to the Carolina Mudcats (CLE), 4-2. Kukuk only lasted 3 1/3 innings, walking seven and striking out four while permitting two runs. William Cuevas threw the final 5 2/3 innings, allowing two runs on five hits. The lone bright spot for Salem on offense was Aneury Tavarez, who went 2 for 3 with a home run. The Drive made a late surge, but it was not enough to hold off the Hickory Crawdads (TEX), as the Drive fell by a score of 6-4. Myles Smith allowed the first three runs in 4 2/3 innings, surrendering seven hits and three walks. The Crawdads got the final three runs off of Mike Adams to put the game out of reach. Carlos Asuaje hit a two-run homer in the eighth inning and Kendrick Perkins launched a solo shot in the losing effort. In a back-and-forth game, Lowell fell to the Vermont Lake Monsters (OAK), 8-7 in 11 innings. Willie Ethington allowed four runs in 4 2/3 innings, and Oscar Perez was let down by his defense, allowing three unearned runs to score to tie the game in the eighth. Sam Travis hit his first professional home run as part of a 3 for 5 performance, and Raymel Flores hit his first home run of the season. Jordan Betts and Mauricio Dubon each added triples, with Betts also adding a single. The GCL Red Sox scored three late runs to beat the GCL Twins (MIN), 3-2. Luis Ramos tossed five shutout innings, allowing only two hits while striking out six. KJ Trader picked up his second save by tossing a scoreless ninth. Victor Acosta and Javier Guerra each went 1 for 3 with a walk, and Josh Ockimey added a triple. A six-run ninth inning propelled the DSL Red Sox to a 9-4 victory over the DSL Cardinals (STL). Jervis Torrealba notched his second victory after tossing five shutout innings, striking out six without walking a batter. Luis Alexander Basabe collected two triples, and Rafael Devers added a double to pace the offense, and Yoan Aybar contributed three hits while scoring a run and driving in a run. 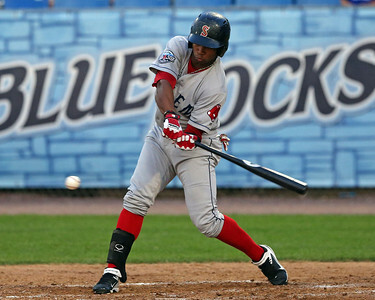 Player of the Night: Keury De La Cruz slugged five hits, to lead Portland to a rout of Reading. De La Cruz has been swinging the bat well since his return from the disabled list, and he now has 14 hits in his last 10 games, which is good for a .368 average.